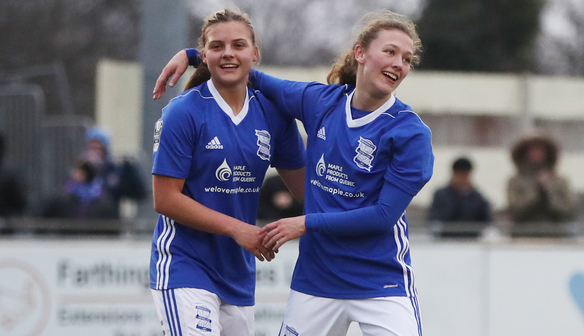 Two goals from Charlie Wellings helped Birmingham City climb up to fifth in the FA Women’s Super League 1 table with a 3-0 win over Everton at the Marine Travel Arena. Goals in either half from Wellings and a late strike from Ellen White secured all three points for the away side, with Andy Spence’s remaining in eighth. Ultimately it was the quality of finishing that proved the difference between the two sides. Both sides enjoy spells of possession in the first half but Wellings’ spectacular opener was the standout moment. Following some neat play on the right wing for the visitors, Wellings found herself in space 30 yards out and her dipping effort flew over Kirstie Levell and into the top corner on 20 minutes. Ellen White almost doubled Birmingham’s advantage on 33 minutes, when a loose ball ricocheted into her path. But her close-range effort was blocked by an excellent challenge from Gabby George. George almost found an equaliser for the Blues three minutes later, but her powerful header was cleared off the line by two Birmingham City defenders. Everton started the second half brightly and skipper Danielle Turner almost found a breakthrough on 54 minutes, after being played through by Jodie Brett but Ann-Karin Berger was quick of her line to make a stop. Birmingham then upped the tempo and found a second goal just four minutes later and Wellings was the scorer again. Her low effort found the bottom corner from 20 yards. White sealed the victory for Birmingham on 86 minutes, showing great balance to avoid two Everton tackles, before blasting an effort past Levell, from distance. Charlie Wellings had a fine afternoon and her opening effort was a thing of beauty as she thumped in the first goal into the net from all of 30 yards. Weelings double her tally in the second period with a low powerful drive beyond Kirstie Levell. Everton's Taylor Hinds: said: "The message from the manager after the game was to keep going as we've still got one game left. “Our performance was good, unfortunately that is not reflected in the score line. “We have to keep enjoying our football, this is our first time in this division and we've done really well this season, to be where we are. Birmingham City's Aoife Mannion said: "It was a really good performance from our team. There were times in the game where Everton caused us problems, but I think the quality of our players shone through. “Ellen White scored a superb goal, Charlie Wellings got two, it was great to see our strikers getting on the score sheet. “Game management is something we have been working on a lot in recent weeks, and it paid off. Everton’s final match of the season comes against Manchester City at the Academy Stadium next Sunday. Meanwhile Birmingham will conclude their campaign at home to in-form Reading at St Andrew’s. Mannion added: “It's Reading up next, and we'll be approaching it the same way as any other game. We've played them a few times, we know what we can expect from them. “We will work hard this week to make sure we put in a positive performance in the last game, and hopefully get three points."